The Gotham Hoops Scouting - 2015-16 Report features two (2) high school prospects and six (6) collegiate athletes. All of these players have been carefully evaluated and followed over the course of their season. The primary geographical focus of the report finds itself in the Northeast. The pair of Aidan Igiehon and Cole Anthony are two talented youngsters from the New York City-area. Locals Jerome Frink (LIU Brooklyn) and Bashir Ahmed (St. John's) make the list with one and two years of college eligibility remaining, respectively. Former Northeast Conference standouts Rodney Pryor (Georgetown) and Cane Broome (Cincinnati) are on to bigger and better things. For Pryor, the chance comes this year as Broome must sit this one out. The final two are West Coast forwards with a lot to prove. Cameron Oliver (Nevada) made a statement as a freshman and has drawn NBA attention following a solid adidas Nations experience this summer. 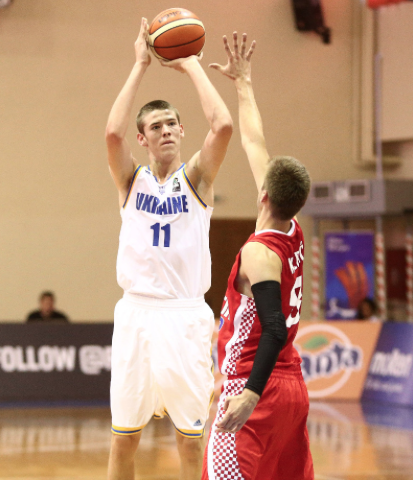 Incoming freshman Vitaliy Shibel will develop at Arizona State and when he does, he'll be another Euro stud. Igiehon is among the best prospects in the Metropolitan area and may very well have the most potential. A native of Ireland, Igiehon is 6-foot-9 and turns 16 later this month. With a large frame and young age, this rising sophomore is slowly but surely maturing as a prospect. Igiehon has the ability to be a game-changer, once it all clicks. He's a more than capable finisher around the rim at this point, primarily using his dominant (right) hand. Granted Igiehon is a power-dunker but he also has a soft-touch around the rim in his arsenal. His outstanding length allows him to cause havoc on opposing shot-takers. He alters (and blocks) shots at a solid rate and hauls down rebounds - both offensively and defensively - arguably better than other big in the Tri-State area. This Lawrence Woodmere Academy (N.Y.) star is rumored to be on the move come next season. Anthony joins Igiehon as one of the best underclassmen in the Metro-area. At this point, he may even be the most talented due to his ability to impact games on both ends of the floor. Anthony (16 years, 85 days) has Russell Westbrook-like explosiveness at the high school level. He enters his second year at Archsbihop Molloy (N.Y.) and follows in the footsteps of former NBA guards Kenny Smith, Kenny Anderson and Russ Smith. The son of ex-NBAer Greg Anthony, Cole is a two-way guard. He protects the rim at 6-feet, 165 lbs. At times, he's a fierce on-ball defender. Cole has sky-high leaping abilities and swats away shots with relative ease. On offense, he has a modest jumper that opens the door for him to attack the glass. His change-of-speed, change-of-direction with the ball is great. His comfortability playing as a point guard will come with more possessions. Oliver will be a breakout star at Nevada next year. After a superb freshman campaign Oliver has the chance to make a name for himself, nationally. He was already one of college basketball's top rebounders last season. What's arguably most interesting is Oliver's progression over the season. He came off the bench early on before starting the final 31 games, including two incredible performances in the Mount West Conference Tournament (avg. 23.5 points, 12.5 rebounds and 3.5 blocks). He shattered the hopes of shot takers around the court, blocking 99 attempts (2.6 BPG) during a historic first year. He's 6-foot-8, 225 lbs., runs the floor and finishes stronger than anyone in the NCAA. As a graduate transfer, Pryor will be suiting up for the Georgetown Hoyas next season. This Pittsburgh product has been a household name in the Northeast Conference the past few years but now has the platform to truly take his game to the next level. Pryor can best be described as a slick-shooting, net-whipping specialist with a bounce in his step. He was overshadowed by sophomore sensation Cane Broome (featured in this report) in the NEC last season. He's competed with lack-luster talent at Robert Morris and fits the mold of a high-major guard. Pryor is 6-foot-4, 205 lbs. and looks like your prototypical college scorer. He's got a bit of Buddy Hield in him, for the fact that he shoots as quickly as an Old Western gunfight. Unlike Hield, Pryor is most effective inside the arc. He scored on 129 of 251 two-point attempts, good enough for 51.3% in 2015-16. Ahmed was casted under the shadow of rookie Isaiah Whitehead throughout high school. A standout at John F. Kennedy the same time Whitehead ruled Coney Island (and New York City) while at Abraham Lincoln, Ahmed went under the radar throughout his prep days before making a splash at Hutchinson Community College in 2014-15. He's an uber athlete with a slick handle and steady pull-up. His length and defensive approach cause issues for opposing ball-handlers. Ahmed often creates fast-break scoring opportunities for his team. Ahmed has next-level hops and is accustom to playing above-the-rim. He returns to the city with two years of eligibility remaining for St. John's. After two years in Connecticut, Broome is on the move. This south-paw scorer will suit up for Cincinnati beginning in 2017-18. Broome was awarded Player of the Year in the NEC last year after averaging a league-high 23.1 PPG. With a smaller frame at 6-foot, 160 lbs., Broome proved to have an incredible sense of deception with the basketball. He can finish with a dunk, at times, but uses his shiftiness to out-duel a defender. Broome has a quick first-step and gets to the rim with relative ease. He has no hesitation in pulling up from well beyond 3PT but is at his best when attacking the basket. At Sacred Heart, he tended to play with a shoot-first, pass-second mentality but with a talented Bearcat team at his disposal for two seasons, Broome will expand his play-making skills. He hails from the Bob Hurley lineage at St. Anthony High School. A New Jersey native, Frink is a well-built combo-forward at 6-foot-6, 215 lbs. He uses his superior strength to fend-off opponents in the lane. Not a terrific outside shooter, shot only 37% (37-98) in 2015-16, he's similar in rookie Jameel Warney that he can knock down the modest mid-range J. Both are Metropolitan standouts (Warney is 3x America East POY; Frink is my bet for the Northeast winner this year) who use their frame and motor to overcome their lack of supreme athleticism. Frink has a great sense of timing around the rim. He led the LIU Blackbirds with 39 blocks, accounting for 44.8% of the team's total last season. Shibel, a native of Ukraine, is the type of low-risk, high-reward recruit that may just help turn things around for Arizona State. He comes to Tempe after a subpar senior season at Lee Academy (ME). Nonetheless, Pac-12 coaches should fear what Shibel can do to their defenses for years to come. He may be too physically challenged (6-foot-9, 195 lbs.) to compete right away but his shot-making abilities will help ease the transition from prep to college hoops. Shibel needs to improve his lateral quickness to stick with players on the wing, as well as put on some weight. Both are characteristics that will soon improve.